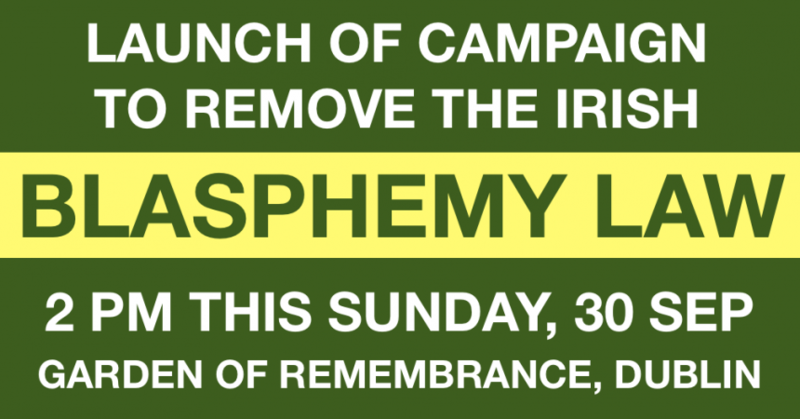 Why: At 2pm this Sunday, 30th September, World Blasphemy Day, Atheist Ireland will officially launch a Campaign to Remove the Irish Blasphemy law, by voting Yes in the referendum on 26th October. Please come along to show your support. The launch will be outside the garden of Remembrance in Parnell Square, Dublin. There will be a photoshoot with our campaign placards, a show of solidarity with victims of blasphemy laws around the world, and details of the campaign and how you can help. Atheist Ireland has lobbied for a decade to get this referendum, both in Ireland and at the United Nations, Council of Europe, and OSCE. We are now looking forward to a busy month seeking public support to finally remove this harmful law. We look forward to seeing you at 2pm this Sunday outside the garden of Remembrance in Parnell Square, Dublin. Find us on facebook and meetup.